The first line of this Psalm throws many for a whirl – “O God of my righteousness!” Some people focus on the English phrase in many Bible translations, and I think it is where we get a little lost. Grammatically, there are two primary readings we can get from the Hebrew. From these two understandings, we learn three things: God is righteous, God is righteous towards His people, and God grants success. All men everywhere condemned him, and his innocence was borne down by the slanderous reports of his enemies and the perverse judgments of the common people. And this cruel and unjust treatment which David met with, ought to be carefully marked. For while nothing is more painful to us than to be falsely condemned, and to endure, at one and the same time, wrongful violence and slander; yet to be ill spoken of for doing well, is an affliction which daily befalls the saints. When trouble is brewing, its a quick step to memory loss. The pressure can cause tunnel-vision, we lose focus on nothing but the difficulty we are facing. As God’s people, we need to keep the knowledge of God at the forefront of our thinking. God has given relief. We have been set apart from the ungodly in His accounting. The Lord has heard our cries in the past. We have been given joy and rest. 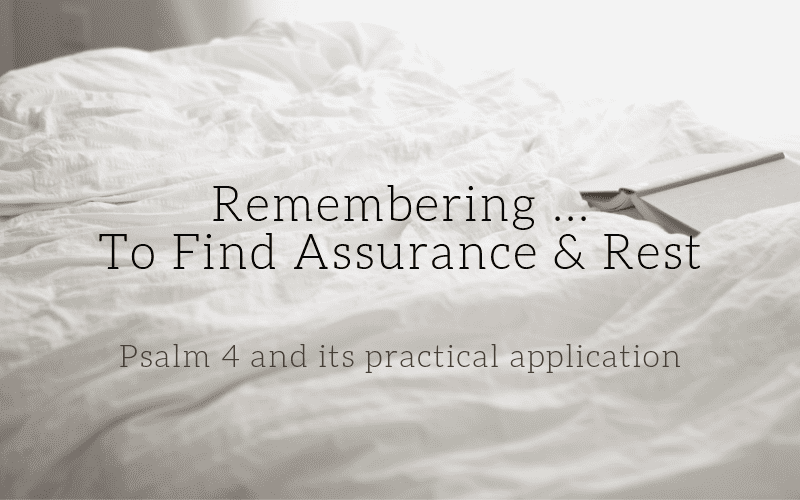 A good memory of the things that God has done is an assurance of what God will do for us. He does not change. That is our hope in conflict. Many modern translations put it as “be angry and do not sin.” This doesn’t seem to fit well with the following command for the wicked, “be still.” Two other translations have been offered, “stand in awe, and sin not,” and “tremble, and sin not.” The intent of God’s demand. God is to be feared, and his judgment for rebellion against him and his people should be dreaded. God condemns the attacks of our enemies and demands them to repent of their offense. God calls them to be still, or a better translation, “cease your rage.” Their warfare is an accumulation of guilt. God calls them to shut their slanderous mouths, stop their aggressive persecution of God’s people, and to repent on their beds. After calling those who are working out evil against David (God’s representative) to stop their raging, they are told to offer “right sacrifices,” or “sacrifices of righteousness.” Evildoers must not only repent of their sins, but they must also turn and worship God. Ceasing rebellion is not enough. Submission is required. What about the faithful? They know the longterm blessing lies in God’s favor, not temporary satisfaction. They seek God, do the works of the Law, and wait for the blessings of the Lord. The highlighted gift that comes with God’s covenant is joy. Even as the lustful bellies of God’s enemies are filled, more joy is found in the heart of God’s people. The people who walk according to the Law of the Lord. In light of the enemies that often try to surround, outgun, and outlast Christianity in history, what response do we have at the end of the Psalm? “In peace I will both lie down and sleep.” One of our obligations in the warfare of Christ against his enemies (Psalm 2; 110; Matthew 28:18-20; 1 Cor 15:24-28) is to rest peacefully in God’s protection. Does this mean that every Christian will be physically protected from the enemies of God? No. This is not a blanket promise of protection from persecution. The point of the matter is that God’s kingdom and covenant shall be preserved and be victorious over the assaults of His and our enemies. Our greatest desire should not be our welfare, for that will lead to unbelievable amounts of doubt, depression, and hopelessness. We should be zealous for the kingdom to conquer and grow, and God’s covenant to be applied more and more in our world. If that is our hope, and it is promised to happen through God’s mighty hand using His Church, then we have nothing but assurance and peace when we fall asleep. 1. God is our righteousness and has taught how to live in His righteousness – by doing His Law. His commands are a reflection of His character. A great, practical guide in following God’s Law is the book of Proverbs. 3. When people are attacking God or His people for their righteousness (ethically speaking), then we must call the offenders to stop their slander and turn to God. On the other hand, if we are rebuked for our moral failure, then we should receive it publically and give restitution if applicable. 4. Even if we are pursuing God’s revealed will, we must not think of Him as a happiness dispensary. This much obedience does not equal x amount of blessing. If we obey only seeking our own gain, unintentionally or intentionally, then we are worshiping the created rather than Creator. 5. Practice resting in God. The Sabbath is a perfect example of God’s provision of trust-filled rest. “What about…? How will I…? I need to…” God promises to provide and protect us, so like David, let us enjoy peaceful rest.